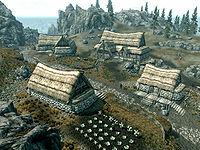 Rorikstead is a farming town in western Whiterun Hold. It is named after the noble Rorik, who owns a 'manor' in the village. The village claims not to have had a bad harvest in years. It contains several crop fields from which you may harvest food. Despite its namesake still living, Rorikstead is mentioned in two much older accounts: The Merethic or First Era text Holdings of Jarl Gjalund (as "Rorik's Steading") and the Atlas of Dragons from the Second Era. This may be a mistake on the developers' part. It is also mentioned in the bard's song Ragnar the Red as "ole Rorikstead", which may be taken to indicate that the current town is the namesake of an ancient predecessor. The above encounter, throughout most of the game, is likely to be with a random unnamed dragon: however, the named dragon Nahagliiv is buried in a mound not far west of the town, and will be resurrected by Alduin during the main quest line. This page was last modified on 7 January 2019, at 04:33.